Liquid error: Index was outside the bounds of the array. 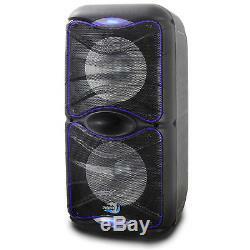 DOLPHIN SP-212RBT RECHARGEABLE BLUETOOTH PARTY SPEAKER SYSTEM DUAL 12 3600 WATT. A professional Bluetooth speaker system with an exceptional sound quality and stunning LED lights. Includes a wired karaoke microphone and an internal 7000 mAh battery for long playing times. 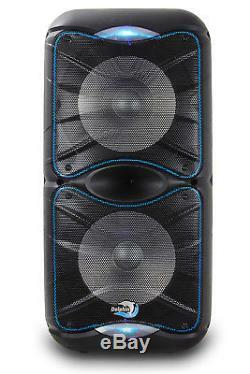 SP-212RBT is an ideal speaker for all settings from your room to a large outdoor party. Bluetooth & USB Dock Charger. This speaker includes the latest generation of Bluetooth which allows you to play music from up to 30ft away without cables. Play music reliably without worrying about cable. Compatible with all bluetooth devices such as iPhones, Androids, and Laptops. With a flip of the switch on the rear panel, the multicolor sound activated lights will turn on and change color as well as pulsate along with the beat of the music. This creates for a stunning multicolor light show that is unique to each song. 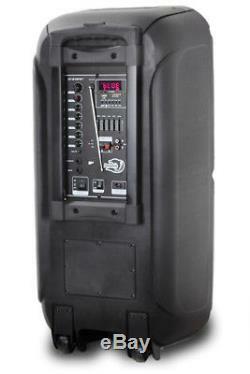 SP-212RBT is one of the largest bluetooth speakers in existence that allow you do mount it on to speakers stand. This feature is useful any professional setup or for those that want to keep the speaker outdoors and off of the floor. This speaker comes with a wired microphone included in the box. Great for karaoke or parties where you will be making announcements to your guests. 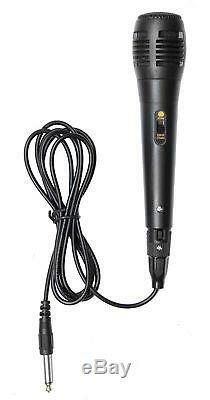 For an easy karaoke experience, you can simply connect this microphone into the rear of the unit, pair your Bluetooth device, and search for your favorite song on YouTube with the lyrics. SD / USB MP3 Player. With the included SD and USB ports, you can use your USB or SD cards as albums or playlists by placing your music files on them. Then insert your USB or SD card in their respective port and the speaker will automatically begin to play the songs. You can then skip through the songs with the buttons and interactive display. 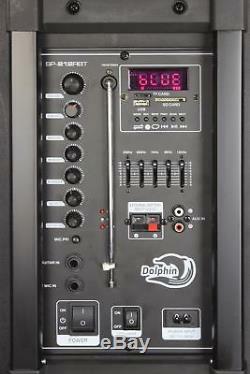 Two 1/4 Microphone and Guitar Inputs. With the two embedded 1/4 audio jacks, you can connect a microphone and a Guitar and control the sound of each separately. This allows for you to sing or shred along with the music that is playing though any of the other inputs and have control of each audio source. This speaker really provides for the ultimate karaoke experience. This bluetooth speaker system was made to be utilized in a variety of settings. In a party setting, SP-212RBT is guaranteed to always be the life of the party. This speaker alone can comfortably entertain a party of 50+ people indoors or outdoors. The included 7000 mAh high capacity battery can outlast each and everyone of your guests and still have some juice left over for later. The sound activated lights can be turned on or off which also makes it ideal for inside your home. Dual 12 Rechargeable Party Speaker. Included Remote Control, Wired Microphone, and External Battery Connector Cable. Neon Style Light & Woofer Lights with Switch. Main Channel: Bluetooth, USB, SD, TF, FM, or AUX. One 1/4 Microphone Jack with Vol. Treble, Bass, and Echo Controls. One 1/4 Guitar Jack with Vol Control. Dual 12 Woofers with 35mm Voice Coils and 20.8 oz AlNiCo Magnets. Horn Tweeter with 10.6 oz AlNiCo Magnet. Built-In 7000 mAh 12V Acid Battery with Ext. Unit Dimensions (in): 32 x 14 x 14. Unit Weight (lbs): 37.3. Manual Language: English &ish. If your item is defective within the first 30 days of when it was delivered to you; you have the following options. We will send you a. To replace the item for a brand new one. If you want to return your item within the first 30 days of when it was delivered to you; you have the following options. This includes blown speakers with burned voice coils. The item "Dolphin SP-212RBT Rechargeable Bluetooth Party Speaker System Dual 12 3600 Watt" is in sale since Wednesday, November 28, 2018. 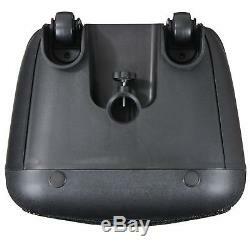 This item is in the category "Consumer Electronics\Portable Audio & Headphones\Portable Stereos & Boomboxes". 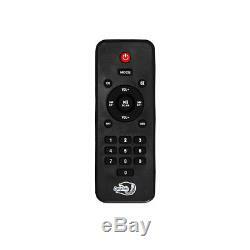 The seller is "zxuby_shops" and is located in Los Angeles, California. This item can be shipped to United States, Canada, United Kingdom, Denmark, Romania, Slovakia, Bulgaria, Czech republic, Finland, Hungary, Latvia, Lithuania, Malta, Estonia, Australia, Greece, Portugal, Cyprus, Slovenia, Japan, China, Sweden, South Korea, Indonesia, Taiwan, South africa, Thailand, Belgium, France, Hong Kong, Ireland, Netherlands, Poland, Spain, Italy, Germany, Austria, Bahamas, Israel, Mexico, New Zealand, Philippines, Singapore, Switzerland, Norway, Croatia, Brazil, Chile, Colombia, Viet nam.